Loosing a loved one is the most painful time period in our lives. If the loss of your loved one is due to another person or business’s negligence, intentional harm, greed or incompetence the pain and anger can be unbearable. Unfortunately, wrongful death incidents are not uncommon, but the good news is that you don’t have to sit by hopeless. While, money can never replace a loved one it is a positive step to help you move forward, and it sends a message to the wrongdoer that their actions will not be tolerated. 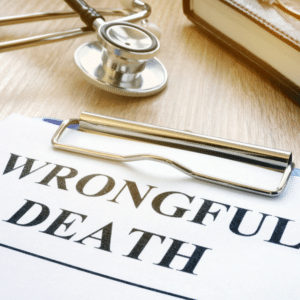 If you are going to pursue a wrongful death lawsuit it is imperative that you choose the right lawyer for you. You should feel comfortable and trust that the attorney knows what he/she is doing and has your best interests at heart, after all it is their job to take some of the stress and burden off of you. Here are a few qualities to look for in a wrongful death attorney. Personal injury law is constantly changing and evolving. It is vital to find an attorney who knows and keeps up to date with the law. The attorney should also have the know how and resources to conduct a wrongful death investigation. It is important that an investigation in these types of matters begin immediately when the evidence and memories are fresh. Just as important, you need an attorney that can communicate what your loved one meant to your family both to insurance companies and also to the jury. The attorneys at Sieben & Cotter understand the great loss that your family has suffered. We take the approach of visiting your loved one’s home, workplace and friends, so that we are able to get to the core of who they were and the lives that they affected. We will walk in the shoes of your loved one when telling their story. It is important to hire an attorney with a stellar reputation in the legal community. The attorneys at Sieben & Cotter pride themselves on their reputation. In fact, many of our clients either keep coming back or are referrals from previous clients or other attorneys. We also have a great reputation within the legal community whether it is with other attorneys, judges or court staff. Find us on Avvo®, Super Lawyers®, or check out our Testimonials to see for yourself. As the old expression goes: “always trust your gut.” This holds true for choosing the right wrongful death attorney for you and your family. At Sieben & Cotter, we offer a free initial consultation and we work on a contingent fee basis – meaning we don’t receive any payment unless you also recover proceeds from your loss. At the consultation, we want to hear your story, to tell us about your loved one and we also want to know about the circumstances of your tragic loss. From there we will be able to provide you with a roadmap on our approach to the case. We will answer all your questions. You should walk out of your meeting with us confident and comfortable that we are the right attorneys for you. Our goal is justice and fair compensation for your family.